It’s my last day in Indianapolis. It’s been hard work and I’ve met some great people. I’ve experienced Indianapolis’s hottest day since 1954, and *really* learned to appreciate good air conditioning. Have we, in the last two weeks, defined what a deep map actually is? In a sense we did, but more importantly than the semantic definition, I reckon we managed to form a set of shared understandings, some fairly intuitive, which articulate (for me at least) how deep mapping differs from other kinds of mapping. It must integrate, and at least some of this integration must involve the linear concepts of what, when and where (but see below). It must reflect experience at the local level as well as data at the macro level, and it must provide a means of scaling between them. It must allow the reader (I hereby renounce the word ‘user’ in relation to deep maps) to navigate the data and derive their own conclusions. Unlike a GIS – ‘so far so Arc’ is a phrase I have co-coined this week – it cannot, and should not attempt to, actualize every possible connection in the data, either implicitly or explicitly. Above all, a deep map must have a topology that enables all these things, and if, in the next six months, the Polis Center can move us towards a schema underlying that topology, then I think our efforts, and theirs, will have been well rewarded. The bigger questions for me are what does this really mean for the ‘spatial humanities’; and what the devil are the spatial humanities anyway. They have no Wikipedia entry (so how can they possibly exist?). I have never particularly liked the term ‘spatial turn’, as it implies a setting apart, which I do not think the spatial humanities should be about. The spatial humanities mean nothing if they do not communicate with the rest of the humanities, and beyond. Perhaps – and this is the landscape historian in me talking – it is about the kind of topology that you can extract from objects in the landscape itself. Our group in Week 2 spent a great deal of time thinking about the local and the experiential, and how the latter can be mapped on to the former, in the context of a particular Unitarian ministry in Indianapolis. What are the stories you can get from the landscape, not just tell about it. Allow me to illustrate the point with war memorials. The city’s primary visitor information site, visitindy.com, states that Indianapolis has more war memorials than any city apart from Washington D.C.. Last Saturday, a crew of us hired a car and visited Columbus IN, an hour and a half’s drive away. In Columbus there is a memorial to most of America’s wars: eight by six Indiana limestone columns, arranged in a close grid formation with free public access from the outside. Engraved on all sides of the columns around the outside, except the outer facing edges, are names of the fallen, their dates, and the war in which they served. On the inner columns– further in, where you have to explore to find them, giving them the mystique of the inner sanctum – are inscribed the full texts of letters written home by fallen servicemen. In most cases, they seem to have been written just days before the dates of death. The deeply personal natures of these letters provide an emotional connection, and combined with the spatiality of the columns, this connection forms a very specific, and very deliberately told, spatial narrative. It was also a deeply moving experience. 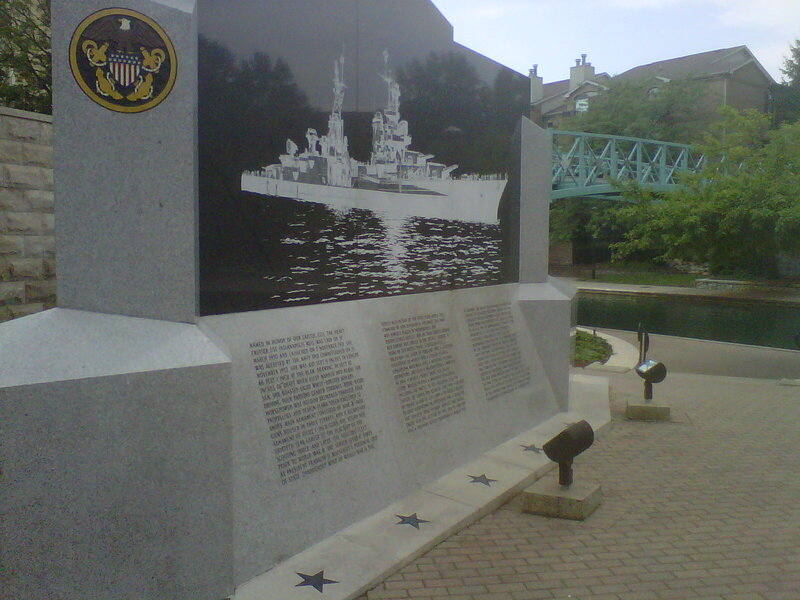 Today, in Indianapolis itself, I was exploring the very lovely canal area, and came across the memorial to the USS Indianapolis. The Indianapolis was a cruiser of the US Navy sunk by Japanese torpedoes in 1945, with heavy loss of life. Particular poignancy is given to the memorial by a narrative of the ship’s history, and the unfolding events leading up to the sinking, inscribed in prose on the monument’s pedestal. I stood there and read it, totally engrossed and as moved by the story as I was by the Columbus memorial. The point for deep maps: American war memorials tell stories in a very deliberate, designed and methodical way, to deeply powerful effect in the two examples I saw. British war memorials tend not to do this. You get a monument, lists of names of the fallen and the war in question, and perhaps a motto of some sort. An explicit story is not told. This does not make the experience any less moving, but it is based on a shared and implicit communal memory, whose origins are not made explicit in the fabric of the monument. It reflects a subtle difference in how servicemen and women are memorialized, in the formation of the inherently spatial stories that are told in order to remember them. This is merely one example of subtle differences which run through any built environment of any period in any place, and they become less subtle as you scale in more and more cultures with progressively weaker ties. Britain and America. Europe, Britain and America. Europe, America and Africa, and so on. We scale out and out, and then we get to the point where the approaches to ‘what’ ‘when’ and ‘where’ – the approaches that we worked on in our group – must be recognised not as universal ways of looking at the world, but as products of our British/American/Australian backgrounds, educations and cultural memories. Thus it will be with any deep map. How do we explain to the shade of Edward Said that by mapping these narratives we are not automatically claiming ownership of them, however much we might want or try not to? How deep will these deep maps need to go…? Deep mapping – we think, although we’ll all probably have changed our minds by next Friday, if not well before – is about representing (or, as I am increasingly preferring to think, remediating) the things that Ordnance Survey would, quite rightly, run a perfectly projected and triangulated mile from mapping at all. Fuzziness. Experience. Emotion. What it means to move through a landscape at a particular time in a particular way. Or, as Ingold might say, to negotiate a taskscape. Communicating these things meaningfully as stories or arguments. There has been lots of fascinating back and forth about this all week, although – and this is the idea at least – next week we move a beyond the purely abstract and grapple with what it means to actually design one. Corporate cartographers are demolishing thousands of years of history, not to mention Britain’s remarkable geography, at a stroke by not including them on [GPS] maps which millions of us now use every day. We’re in danger of losing what makes maps so unique, giving us a feel for a place even if we’ve never been there. To put it another way, are ‘thin maps’ really all that ‘thin’, when they are produced and curated properly according to accepted technical and scholarly standards? Maps are objects of emotion, in a way that texts are not (which is not to deny the emotional power of text, it is simply to recognize that it is a different kind of power). Read Mike Parker’s 2009 Map Addict for an affectionate and quirky tour of the emotional power of OS maps (although anyone with archaeological tendencies will have to grit their teeth when he burbles about the mystic power of ley lines and the cosmic significance of the layout of Milton Keynes). According to Spence, a map of somewhere we have never been ties together our own experiences of place, whether absolute (i.e. georeferenced) or abstract, along with our expectations and our needs. If this is true for the lay audiences of, say the Ordnance Survey, isn’t the vision of a deep map articulated this past week some sort of scholarly equivalent? 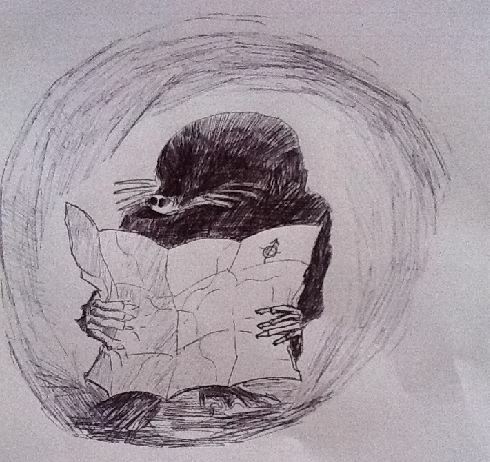 We can use an OS map to make a guess, an inference or an interpretation (much discussion this week has, directly or indirectly, focused on these three things and their role in scholarly approaches). What we cannot do with an OS map is annotate or embed it with any of these. The defining function of a deep map, for me, is an ability to do this, as well as the ability to structure the outputs in a formal way (RDF is looking really quite promising, I think – if you treat different mapped objects in the object-subject-predicate framework, that overcomes a lot of the problems of linearity and scale that we’ve battled with this week). The different levels of ephemerality that this would mean categorising (or, heaven help us, quantifying) is probably a story for another post, but a deep map should be able to convey experience of moving through the landscape being described. There are other questions which bringing such a map into the unforgiving world of scholarly publication would undoubtedly entail. Must a map be replicable? Must someone else be able to come along and map the same thing in the same way, or at least according to their own subjective experience(s)? In a live link up the UCLA team behind the Roman Forum project demonstrated their stuff, and argued that the visual is replicable and –relatively easily – publishable, but of course other sensory experiences are not. We saw, for example, a visualisation of how far an orator’s voice could carry. The visualisation looks wonderful, and the quantitative methodology even more so, but to be meaningful as an instrument in the history of Roman oratory, one would have to consider so many subjective variables – the volume of the orator’s voice (of course), the ambient noise and local weather conditions (especially wind). There are even less knowable functions, such as how well individuals in the crowd could hear, whether they had any hearing impairments etc. This is not to carp –after all, we made (or tried to make) a virtue of addressing and constraining such evidential parameters in the MiPP project, and our outputs certainly looked nothing like as spectacular as UCLA’s virtual Rome – but a deep map must be able to cope with those constraints.